At our clinic, we specialize in the medical treatment of foot and ankle disorders. If you are experiencing any form of foot & ankle pain, we encourage you to call our office today to schedule an appointment, so that Drs. Lants & D’Amato can evaluate and determine the best treatment option for your condition. Flat feet are often inherited and deserve early evaluation when others in the family have a history of foot and postural problems. 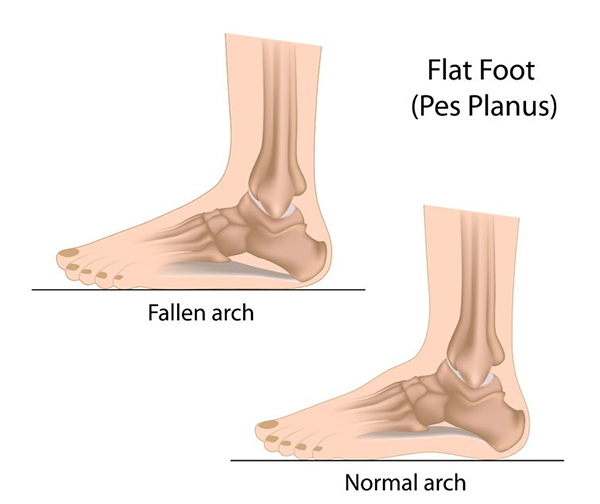 Although flat feet are often the root of foot and postural weakness, not all flat feet need care. Signs of pain, deformity, difficulty in fitting shoes and performance issues caused by flat feet that are nor capable of supporting the posture for a lifetime are best handled aggressively and the sooner the better. Weakness, tiredness and muscular cramps are additional telltale complaints that are relieved with flat foot treatment. Non surgical care of flat feet include special shoe and shoe modifications as well as custom foot orthotics and in advanced cases braces. In advanced cases, reconstructive foot surgery may be necessary if these methods fail. The Podiatrist will coordinate shoe therapists, medical doctors and physical therapists to work as a team to maximize the long term benefits of flat foot care.